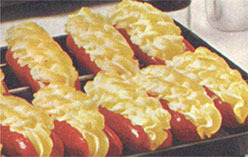 The defining characteristic of these recipes is that their utter lack of appeal is rivalled only by the amount of time it would take to prepare them. If I were planning to spend hours in the kitchen, I'd like to emerge with something that's edible, not comical. The pitchers are full of soup: chilled, canned, condensed soup, to be precise. 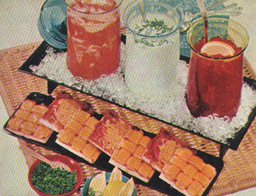 We have tomato with orange juice, potato with cream of chicken, and beef consommé with lemon wedges. But what really floors me are the Lattice Cheese Sandwiches. Yes, it's woven processed cheese slices. Did you really need to ask? 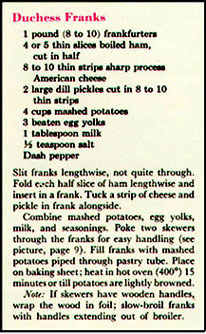 This particular recipe was in a 1962 Better Homes and Gardens Best Buffets cookbook under the delusional heading of "High-society suppers with franks and burgers". 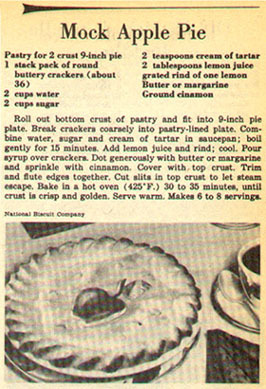 I found a similar recipe in a WWII-era magazine. While I can understand trying to do all you can to make war-time food more interesting, was there really any excuse in 1962, during one of the more prosperous periods in American history? And for dessert? Mock Apple Pie! It's the perfect dish to make when you're craving apple pie and have no access to apples but do have access to a pack of "round buttery crackers". Or else it's just a big ol' joke. The jury's still out, as far as I'm concerned.